80° Below® Lubricants are the latest phenomenon on the market boasting full temperature operating ranges from -90°F to 465°F. Expertly formulated lubricant with 100% select synthetic fluids, it has sufficient body to still penetrate and lubricate in ALL temperatures. The additive package includes an effective combination of cleaner; anti-wear agents; rust preventatives; and oxidation inhibitors. The tackifier is present to create a lubricate adhesion and dry film of lubricant to keep your firearms functioning with a very minimal wear. 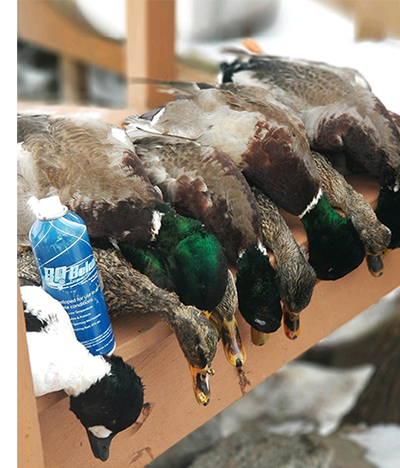 Tested for 5 years in extreme conditions, this lubricant poses to be a “staple” in your household, industry, glove compartment, tackle box, blind bag, or tool box. Confirming reports on this amazing new synthetic lubricant are all over the top from international customers using it for its original purpose of extreme cold weather hunting. Testimonials and tips are pouring in from buyers about their unique uses, applications, results, and star reviews! We love to hear how you used it, and how you loved it! Like us on facebook to follow along! • 100% Synthetic. Extreme low-temperature performance, but performs in ALL temperatures. • Cleans, lubricates, penetrates, and protects. • Firearms will function longer due to lubricant’s ability to reduce power residue retention.